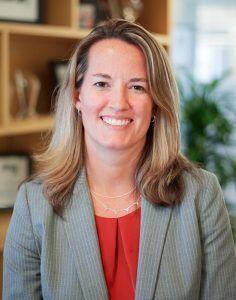 This Industry Perspectives‘ column was one of the most-read on Microgrid Knowledge during the first quarter of 2018. Julia Hamm of the Solar Electric Power Alliance describes her organization’s work fostering microgrids and distributed energy in Puerto Rico — and how she doubled down on her commitment after visiting the hurricane-torn island. Prior to Hurricanes Irma and Maria in September, I was generally aware that Puerto Rico’s electric system was in trouble, with a utility that was more than $9 billion in debt and a grid that was built and maintained below mainland standards. It only took one phone call in October to go from passive awareness to deep engagement in the future of the island. “Julia, you’re being appointed by Governor Cuomo to a small Steering Group that will create a plan to build back Puerto Rico’s grid in a better and more resilient way. Can we count on you?” That call was from Gil Quiniones, CEO of the New York Power Authority (NYPA), who had been tasked by Cuomo to lead the effort as part of New York’s broader commitment to help Governor Rosselló and the 3.4 million people of Puerto Rico. I’m very proud that SEPA was part of the team that produced the resulting report Build Back Better: Reimagining and Strengthening the Power Grid of Puerto Rico. Our staff worked extremely hard as the lead researcher and author on the distributed energy resources and microgrid-specific sections. I have to admit that I initially said “yes” to Gil and Governor Cuomo largely because I saw the opportunity for SEPA to apply what we’ve been doing for the past three years on our 51st State Initiative (a thought experiment with a blank new 51st State, not a push for an existing territory to receive statehood). It felt like the right thing to do in the interest of SEPA and broader efforts to define the future of the U.S. power sector. But in the seven weeks since that call with Gil, my motivation has shifted. Now that I’ve immersed myself in relationship building with people who live in Puerto Rico and I’ve spent time on the island seeing the situation firsthand, I’m “all in.” I’ve seen the suffering and the painfully long road to returning life to normal for millions of Americans. I feel compelled to dedicate my time and the resources of SEPA to do everything we can to both get the power back on and to prevent the next big hurricane from reeking havoc in the same way Maria has. That’s why when the next “big ask” call came in November, I again said yes, agreeing to serve on the newly formed PREPA Transformation Advisory Council (TAC). The TAC has been formed to provide PREPA’s Governing Board and management team with advice on the development of a long term vision and transformation execution plan for the power system in Puerto Rico. It’s a daunting task, and one fraught with layers of political dynamics and challenging financial barriers. But I had no choice, based on the needs of Puerto Ricans, other than to say yes. During a trip to Puerto Rico two weeks ago to meet with a variety of stakeholders, I decided to visit the small mountainside municipality of Adjuntas, which I had heard was particularly hard hit. When I told people in San Juan of my plans, they looked at me in surprise asking whether I was sure I wanted to do that – the road over the mountain to Adjuntas was a harrowing drive even before the hurricane significantly eroded conditions. But away I went, albeit with a newfound sense of apprehension about the journey ahead of me. While most of the hour and 45 minute drive from San Juan to Adjuntas was smooth, it was the seven miles over the mountain that gave me a true appreciation for the challenge ahead to return power to all of the rural and remote Puerto Rican communities. The mountain road to Adjuntas is less than two lanes wide with non-stop sharp curves. Three months after Hurricane Maria, every distribution line is still down with many laying across the road, and the majority of poles are down due to the mudslides. It’s hard to imagine how long it will take to restore power from the central grid to the homes and communities along that seven mile stretch of mountain road and the hundreds of others like it. But one thing seems certain – small distributed energy systems comprised of a couple of solar panels and a small battery can be delivered to these people much sooner, providing at least a minimum amount of power to resume a somewhat normal life. When I finally arrived in Adjuntas Pueblo – the business center of the municipality – I found a beautiful and quaint town square. The good news is that all of the businesses around the square were open. I quickly found a parking spot and stepped out of my car only to be surrounded by the deafening noise of diesel generators. The bad news is that every single one of the stores was operating off a loud and dirty diesel generator. The main purpose of my visit to Adjuntas was to meet with the Executive Director of Casa Pueblo, a community-based grassroots non-profit focused on the protection and management of natural resources. When I arrived they were hosting an event announcing the donation of off-grid power systems to 10 families in the community with medical needs. The systems will include two solar panels and a small battery that power an outlet, two light bulbs and a mini medication refrigerator. 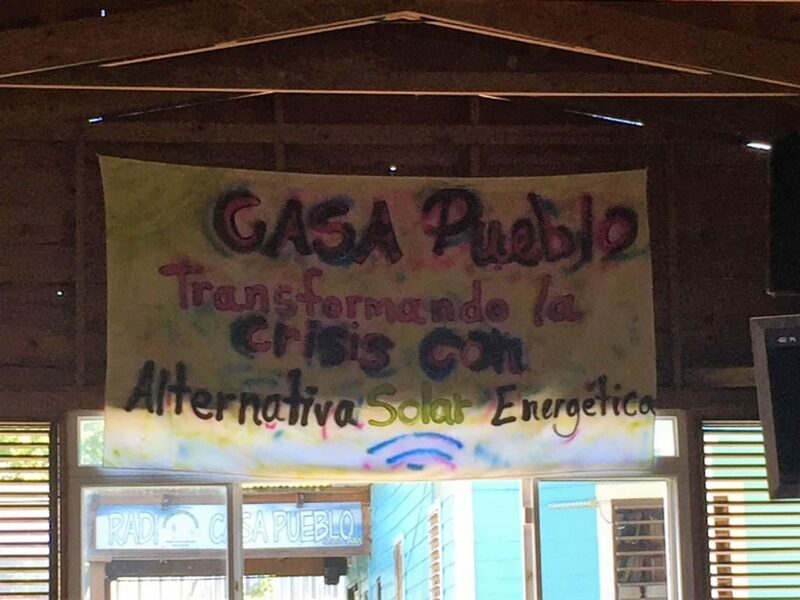 The handmade sign overhead read “Casa Pueblo: Transformando la crisis con alternativa solar energetica.” In addition, they were passing out Ace Hardware buckets and water filtration systems, as the people in the community have been living for 3 months without access to clean water. Unlike the cacophony of the public square, the Casa Pueblo building was energized but quiet thanks to a PV system on the roof and a large bank of batteries on the wall. It is currently the only building in the municipality with power from a source other than a diesel generator – a fact Casa Pueblo is eager to quickly change. Unfortunately my inability to speak Spanish and the limited ability of the people of Adjuntas to speak English made it challenging to engage in conversation at the event that day. But I was overwhelmed with emotion nonetheless just observing what was happening around me for more than two hours. The resilience of the people was unquestionable. They were continuing to go about their lives, largely in good spirits. Despite the lack of power or clean water, they all had on clean and freshly pressed clothes. But it’s not only those in remote communities who are demonstrating their resiliency. I met with plenty of business people in San Juan who are still living without power in their homes, yet are making their way to work every day. And I met with people who are working in crowded office conditions because they have opened their doors to employees of other companies that are still without power on the other side of town or, in some cases, just down the street. Without a doubt the people of Puerto Rico are resilient. And those of us who are mainland energy experts have a responsibility to help ensure that their rebuilt power system is too. As we head into the new year, many of us will personally take stock of 2017 and resolve to do better in 2018. I challenge you as part of that exercise to think about how you can help Puerto Ricans rebuild their lives and their power system. Can you “say yes” to helping these fellow Americans in need? Become an active participant in Puerto Rico Energy Commission dockets. They need mainland experts to advise as the transformation plans unfold. Sign up today to receive notifications via email on regulations, orders and other communications from the commission. Make a product and/or monetary donation to Solar Saves Lives. This initiative is coordinating the delivery and installation of donated solar and storage equipment to Puerto Rican communities in need. Use your next vacation to visit Puerto Rico and participate in helping to rebuild the island. The Puerto Rico Tourism Company will be hosting a series of Rebuild Days at various natural attractions around the island, and opportunities to volunteer with other organizations are beginning to emerge. Can Waste-to-Energy Microgrids be the Missing Link for Puerto Rico? Microgrids make a lot of sense for Puerto Rico as it rebuilds; no one would deny that. Solar, Wind, Storage and back up is an unbeatable combination, IMHO. Were diesel generators the best option for Puerto Rico prime power? probably not. How about in disaster recovery mode? I bet if you ask the citizens of Puerto Rico whether having diesel generators has helped them gain some footing back, be able to open businesses, have manufacturing jobs come back online, get some clean water pumped and more, they would probably say yes – thank goodness we have the generators, and even with the noise. New diesel generator systems can do much better because they are whisper quiet and have advanced noise containment and can also have near zero emissions but i doubt these state of the art units are standard issue in PR. Overall, it’s a good first hand account and pitching in to help Puerto Rico get back on its feet is a good call to action. The “Build Back Better” report was hugely disappointing to me, especially the section on microgrids. It appeared as if microgrids were paid a lip service, and, in fact, the aim was to sabotage any microgrid deployment efforts. My article above lays out my analysis of that section in the report. Please also see the comments below the article. Microgrids are definitely the future for PR, or should I say, the future of PR is microgrids. There are two problems. The first is that neither the Build Back Better report nor the government Microgrid Rules, suggests a complete rethinking of the grid and PREPA’s future role. Everyone sidestepped the elephant in the room. Until real structural change is implemented there is little chance that the private sector will invest. Second, the report and the rules seem to think that microgrids are synonymous with renewable energy. For microgrids to be efficient, reliable and resilient, there will need to be a mix of conventional generation, with various fuels and fuel sources, CHP, solar, wind, battery, and fuel cells, all designed based on the specific projects size and location. Once the big hurdle of structural reform is complete, microgrids will rollout very quickly.